A Week of Shimmer - Day Five, My Holiday Picks! Welcome to the last day of the Week of Shimmer! 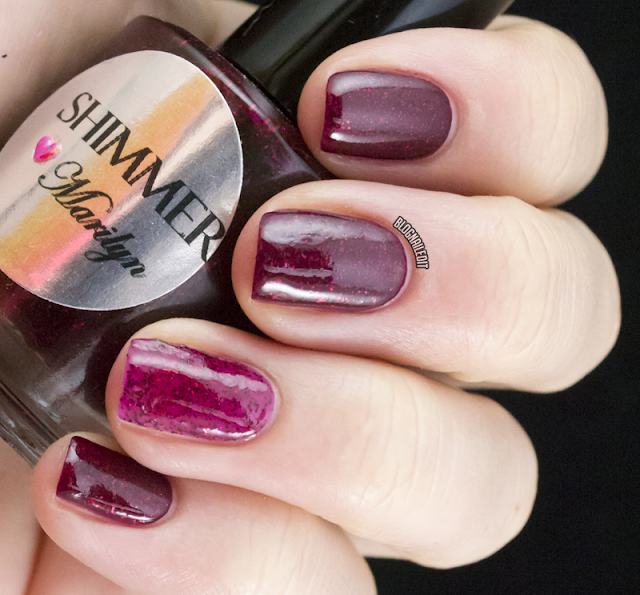 Today I'm showing you seven colors that are absolutely perfect to deck your nails for the holidays! Whether that's a New Year's Even look or a Christmas pageant special, you'll need these in your collection. Alice. Oh my god Alice. Take me down the rabbit hole, because you're a gorgeous stunner! 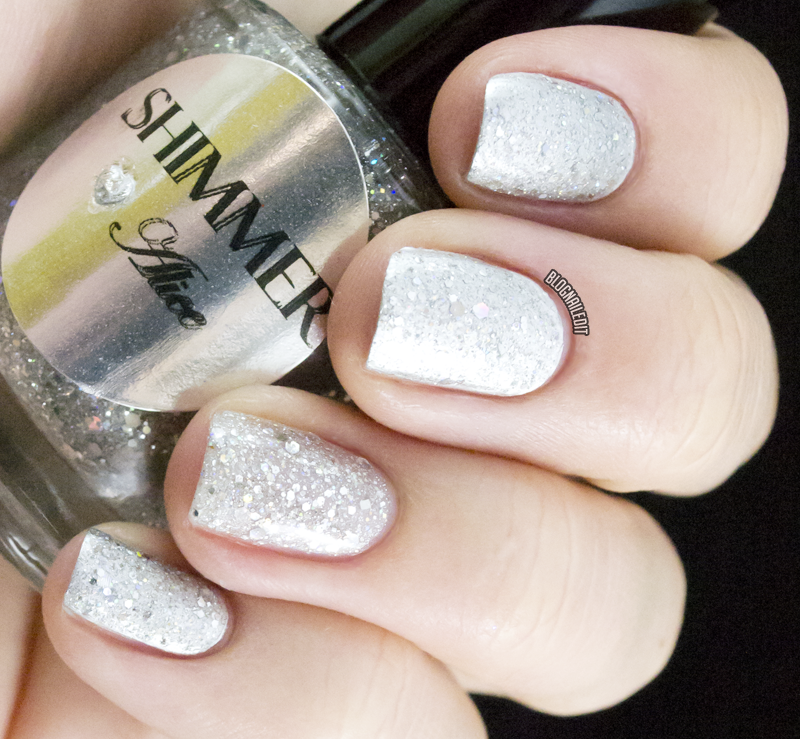 Unfortunately, I can't fully capture this beauty, which is silver holographic glitter pieces. It seemed perfect to use over No Place Like Chrome (essie). An obvious New Year's Eve choice. Cindy is named for the company's lovely founder, and could be one of my favorite jelly glitters of all time. In the red jelly base is red glitter and small accents of gold. I used it over Carmen (Zoya). This is a lovely Christmas dinner spectacular. Cristina Christmas...that's the name I've given Cristina. 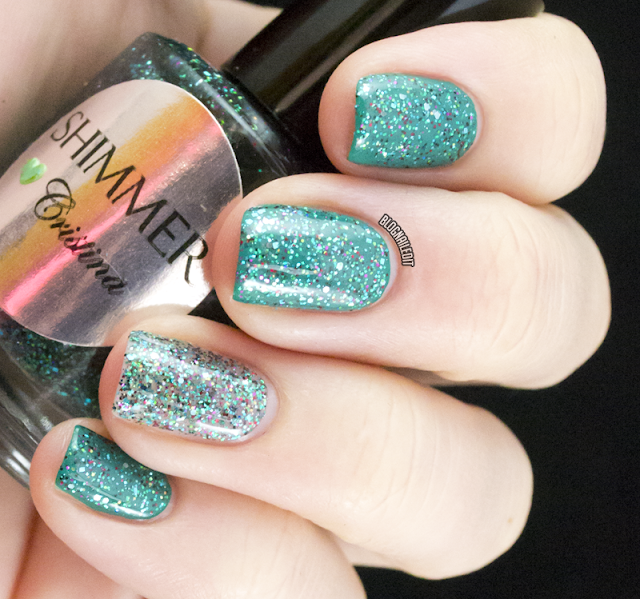 These dark green/teal glitter has red and purple accents, in a clear base. I used it over teal (Wild Cactus from Color Club), so it looks more teal, but in person, it appears more green. Julia works as both a holiday neutral color, as well as a great pick for Hanukkah. Perfect, since I have a friend named Julia who's Jewish! 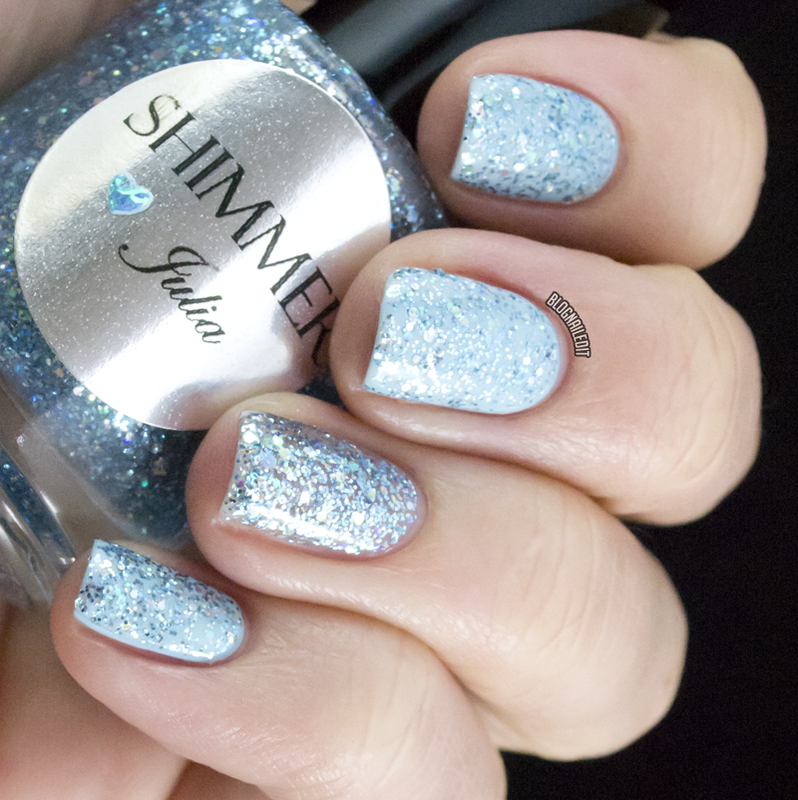 It's an all pale blue glitter with larger accents of holographic pieces. It works as a winter wonder over Blueberry Blast (Misa). Now Katherine isn't the most traditional Christmas color, but it reminds me of cinnamon on hot chocolate, which is about as Christmas as it gets! I love that these pieces are all the same size, and vary from copper to brown to gold. It's used here over Farah (Zoya). Marilyn is way prettier than my swatch. I promise. I used a chunky top coat for this swatch, and it's unfortunately muddled the beauty. I also picked a color that doesn't quite highlight it as well (Purr-fect Plum from China Glaze). 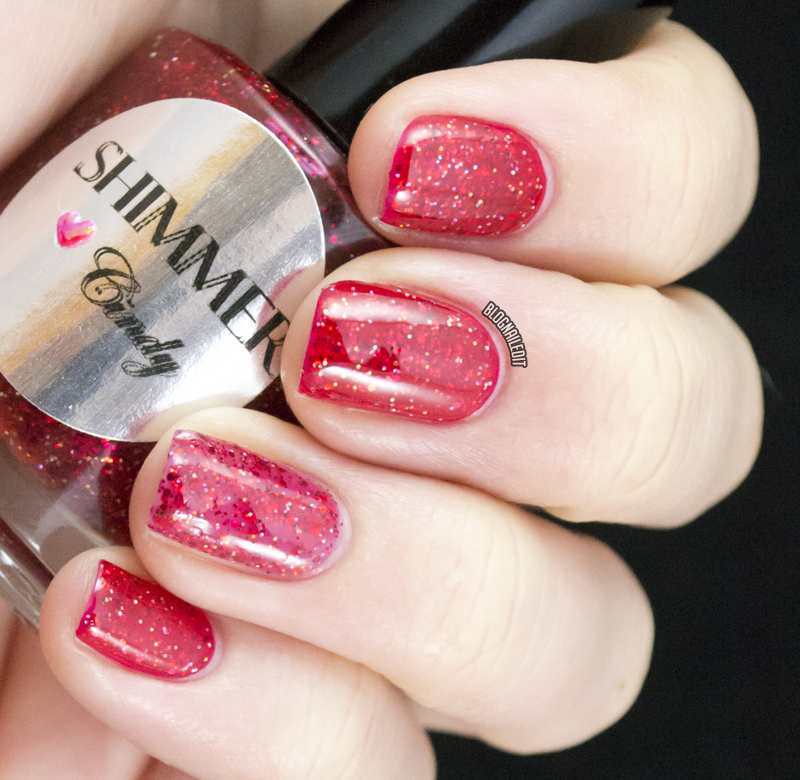 Marilyn is a deep red jelly base with all red glitter, virtually all the same size. 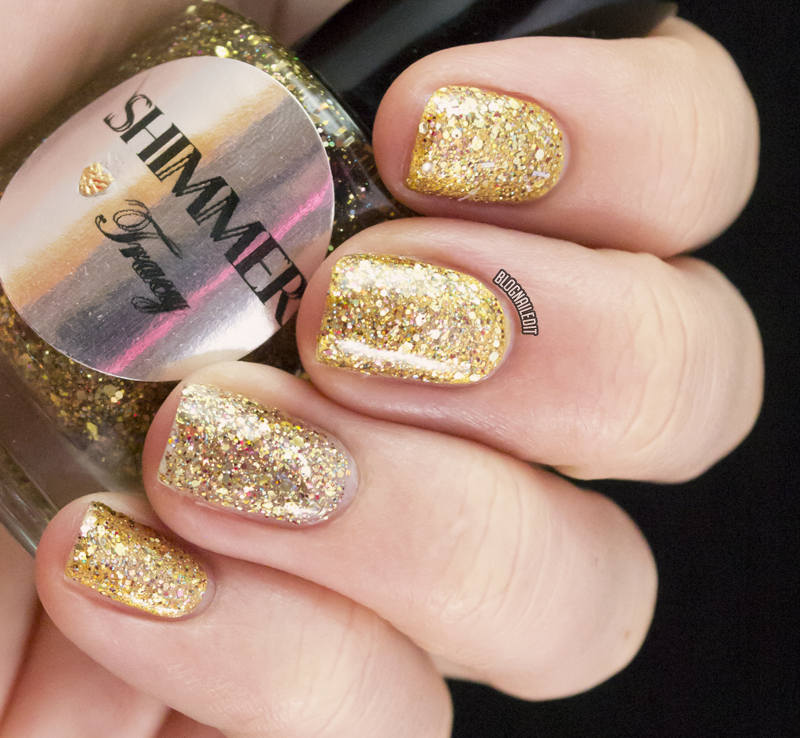 The pot of gold at the end of this Week of Shimmer is one of the best gold glitter mixes I've ever used, Tracy. She's a yellow gold glitter and even has a few bar pieces, and spatterings of holographic beauties! I used it over Goldie (Zoya). Which of these holiday picks do you like most? 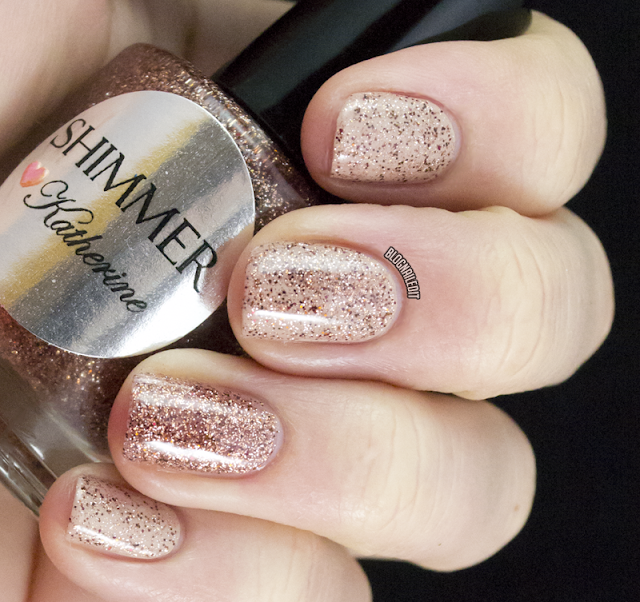 This is the last of the Week of Shimmer! I hope you've enjoyed reading it as much as I've enjoyed posting it! All of the polishes from the Week of Shimmer are available in the Shimmer Store for $12, and custom mixes can be discussed with the store owner, Cindy, for $15. OBSESSED with the Marilyn. Gimme. Love the last one! Perfect gold shimmer!